Today’s recipe is a very simple weekday salmon dinner. It’s a twist on an old sweet and sour salmon recipe I used to make and have gradually improved over time. It can be served with a variety of dishes, we’ve had it with couscous, white bastati rice, salad. Most recently though, I love having it with jasmine rice. I just love how the sticky texture goes with the easters inspired flavourings. I make this dish a lot, because all the ingredients are things I always have on hand. I usually just have to grab some salmon fillets on my way from work, and everything else I would already have in the kitchen. 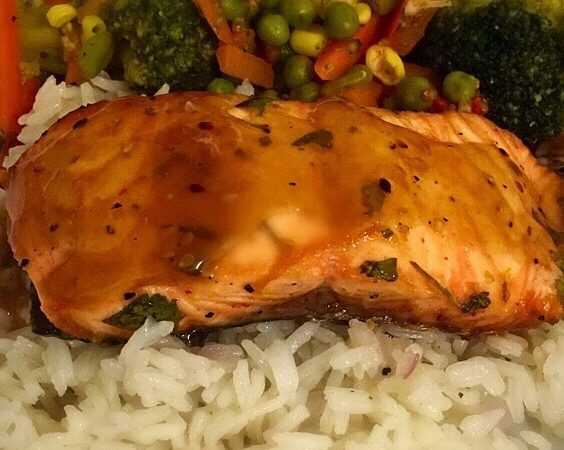 Mix everything except for the sesame seeds and hot water and pour half of it in a plastic bag with salmon and leave it in the fridge for 1 hour maximum. While that cooks you need to make your sauce. To make the sauce pour your remaining liquid ingredients in a pan on a low heat with the hot water. Meanwhile mix a tablespoon of cornflour with a tablespoon of cold water and set aside. Once the sauce starts bubbling slowly pour in your cornstarch mixture while stirring. Add it in bit by bit until you have your desired thickness. Once ready serve over your desired dish and garnish with some toasted sesame seeds and some sauce.